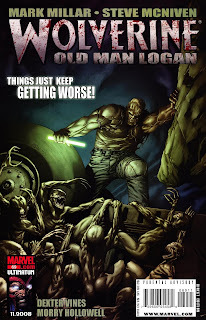 Summaries and reviews of my favorite comic book series. The opening scene is at the Hulk Gang's watering hole, where two members -- Woody and Rufus -- are washing off the blood from their clothes. Woody then finds himself alone then notices that Rufus is already dead, hist body cut to pieces. Then Logan surprises him then kills him. At Banner's Lair -- appears to be a converted trailer park -- several more of the Hulk gang are killed when the Beau's C4-filled Fantastic-car stampeded down the trailer vans. Standing on the car was Beau all chained and wrapped up with C4 and a timer taped over his mouth. Timer reaches zero and boom goes Beau and several other of the Hulk gang. 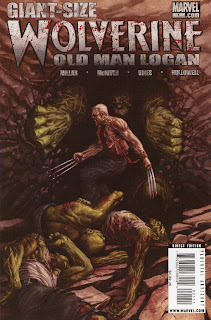 Logan then finishes off the remaining Hulk gang. The out came from the nearby cave the first and orignal Bruce Banner himself, now a small and balding aged man -- but still packs quite a punch even in his "human" form. He beats down Logan even throwing - erm - a dead cow carcass on him. 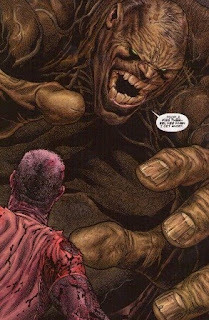 Logan then got an upperhand and drives his adamntium claws through Banner's chest. This made him very angry and he "hulked" out. Hulk grabbed his enemy and took a bite off from Logan's side. Note: In their encounter, Bruce reveals that he mated with her first cousin, Jen Walters, aka She-Hulk. Twelve hours later, another Hulk gang member, Billy Bob, out on errand to fetch some movies returns to find his gang dead. He found Bruce, still in Hulk form, inside the cave nursing his stomach cramps. Bruce then bowled over then out came Logan through his back, presumably killing Bruce in the process. A month later, Logan lays to rest his entire family. 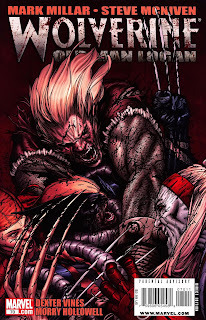 After the final blessings, Logan leaves the townsfolk saying that he's forming a new team of heroes. And his first team mate is none other than the baby Bruce Banner Jr.
Then off he rides into the sunset. He awaits the arrival of Tobias' party, carrying the vials of super soldier serum and the bodies of Hawkeye and Logan inside the body bags. 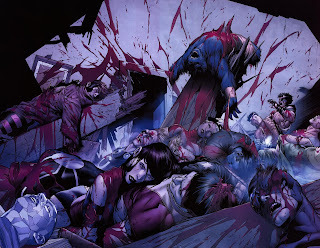 As they start to unwrap the body bags, Logan comes to and dispatches everyone in the room until Red Skull is the only one left. 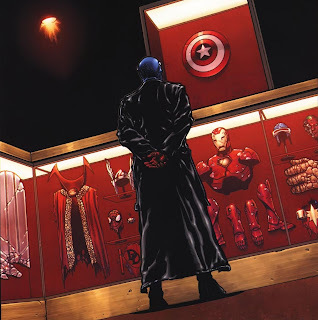 Red Skull - at this time the better fighter and in better shape -- batters Logan around the trophy room, crashing into the shelves. 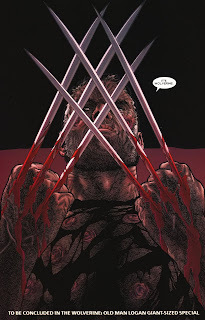 He criticizes Logan for not even popping his adamantium claws. The automatic doors of the trophy room shuts close, isolating the two inside from the soldiers outside. He picks up the Black Knight's sword and delivers the finishing blow -- only to be block by Captain America's shield, picked up by Logan among the broken shelves and mementos. Logan, with shield in hand, fights back and beats red Skull down. 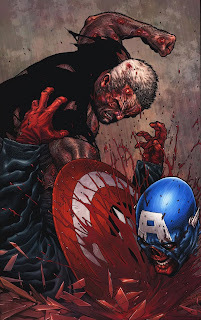 Red Skull falls and is pinned... then Logan decapitates Red Skull with Cap's Shield. By the time the soldiers blasted their way through the door, Logan is already wearing what's left of Iron Man's armor. He hit the soldiers with repulsor blasts then flies off all the way back to California. The fuel rods of the armor finally burn themselves out, he crashlands somewhere near the Calirfornia wasteland. Finally arriving back on his farm, despite of it still two weeks ahead before the deadline, he finds his family murdered. Logan's neighbor says that the Hulk Gang got... bored. And with that, Logan is finally pushed over the edge. For the first time in fifty years... SNIKT! Claws pop out... Wolverine is back! The Venom T-Rex finally catches up with them in Doom's Head, Illinois. They helpless drive and shoot at the Venom to no avail. Shortly, Emma Frost spots them and sends Black Bolt. With one word "stop", he knocks off the Venom symbiote from the TRex. They were instantly teleported to the Forbidden Quarter, the sanctuary of Emma Frost and about twenty other remaining mutants in the world. Emma welcomes them and had her technicians fix up the Spiderbuggy. 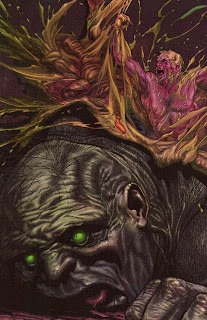 It is revealed that Emma Frost married Dr. Doom in order to forge a pact in the interest of the mutants -- first thought to be the next step in human evolution, but is obviously not to be, with no new mutant births in the last twenty years. Emma also hints that she knows what's in the package they're carrying, which caught the interest of Logan. After the repairs are done, they set on their way towards their destination. They pass by Pym Falls, Connecticut -- a settlement built on the remains of Hank Pym aka Giant Man -- which then leads to New babylon, their destination. There, they met their contact, Tobias, who looks like Hitler with that mushtache of his. Logan then learns that the package they are carrying the entire time contains 99 vials of the super soldier serum. Tobias is supposedly a rebel alliance contact that are bent to creating a new Avengers team, which Hawkeye wishes to be a part of. Shortly after, Logan is peppered with bullets and Hawkeye shot in the chest. 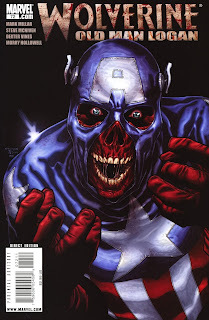 Tobias then reveals himself to be a SHIELD undercover agent under the employ of the president Red Skull. Defiant to the end, Tobias shoots Hawkeye on the head. Logan finally reveals what happened to him fifty years ago -- the day Wolverine died. 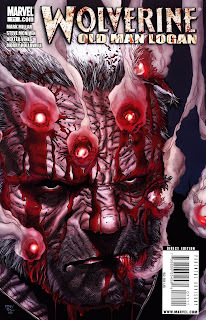 Logan goes back fifty years back in the X-Mansion in Westchester where he was with Jubilee. Suddenly, there was an explosion which kills off Jubilee, then several supervillains appeared -- Stryfe, Doctor Octopus, Shocker, to name a few. He lashes out at every villain he sees while looking for the rest of the X-Men who are nowhere to be found. He kills each and everyone of the attackers. One by one, the villains go down, until it Bullseye is the last one left. After finally finishing him off with a straight claw thrust through and through, the truth is revealed -- he just gutted Jubilee. After an indefinite amount of time, Wolverine just wandered off the forest crying and sobbing, and cannot think straight. He wants to punish himself for what he had done. 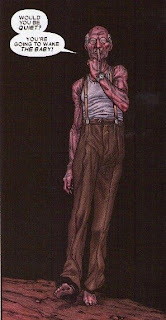 After passing by a railroad, he waited for a train, laid down on the tracks and just waited there to be killed -- which did not happen due to his advanced healing factor. With that, he swore never to hurt another living soul again. Next day, they reach Dwight's Toll, basically a short metal bridge, where they were stopped by Dwight, a short guy wearing the original Ant-Man helmet. Paying the toll of eighty cents, they pass by the bridge unscathe. Below the bridge are several remains of who appear to be the ones who did not pay Dwight's toll. 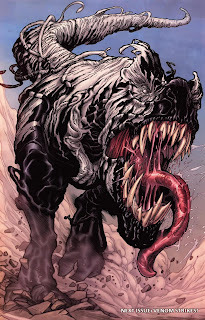 They are passing by Doom's Head, Illinois, where their Venom symbiote stalker now bonded with a T-Rex is madly rampaging through the wasteland waiting chasing after them. As Ashley is about to deliver the deathblow to his father, Hawkeye, Logan drives the Spiderbuggy and rams it through the wall. He then grabs Hawkeye and drives the buggy off to another building and made their escape. Not to be outdone, Ashley commands her troops to go after them. Shortly, the duo are being chased by hundreds of cars and several dinosaurs -- Clint reveals them to be imported from the Savage and has since then covered the MidWest region. Then, things got worse as an earthquake opens up a fissure that swallows everyone up. Two hours pass and Logan comes to. He cracks a light-stick and looks for Hawkeye. 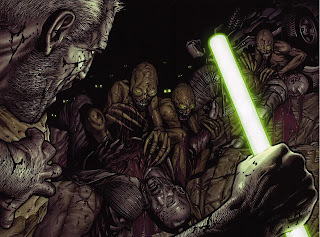 He then encounters the carcasses of their pursuers being eaten by the Moloids, subterranean beings who are easily blinded by the lightstick. Logan finds Hawkeye still strapped into the Spiderbuggy which is upside down. After flipping the buggy rightside up, he flares open the headlights and drives straight up the cavewall. They reach topside again. They pass by Paste Pot Creek, Wyoming, where hundreds of dinosaurs are found everywhere. 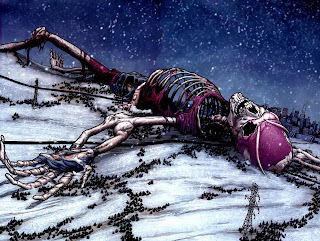 Then they pass by Electroville, where lay the remains of the Baxter Building and the humongous skeleton of Loki. Then they pass by South Dakota, where a hostless "Venom" symbiote spots them. 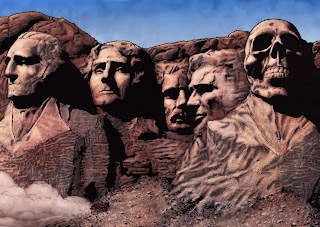 Also, they pass by the new Mount Rushmore, where a fifth figure, that of the Red Skull was added. They made their stop at a certain Millar's bar in Des Moines, Iowa. Shortly, a drunk patron started to make fun of them and, just like his old self, Logan jumps at the guy and is ready to pop his claws down the guy's throat. Hawkeye stops him and Logan walks off to the outside. Hawkeye, confused, asks what happened to him. Finally thinking its about time, he tells him to sit down and he'll tell him. 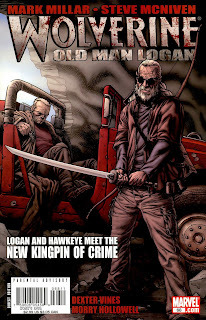 Logan and Hawkeye meet the new Kingpin of Crime! Logan and Hawkeye learns that Ashley -- Hawkeye's daughter to Tonya, Peter Parker's daughter -- is held captive by the new Kingpin. 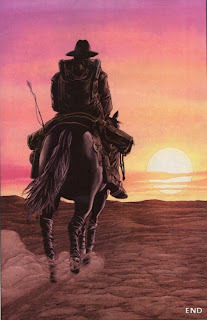 Clint convinces Logan to help him find his "superhero" daughter and his pay is doubled -- despite the fact that Logan will only help him as a map-reader, and will not fight; Logan is adamant that he will never EVER pop his claws again. Ultron then gives Logan an X-Men medallion for good luck -- a brief flashback was shown. They shortly arrive at Cedar City, Utah, most of which is under the ground, with only the rooftops and a big church spire sticking out the ground. On the spire was a man holding on to it, seems paralyzed with fear. They move on. Rice-Eccles Stadium in Salt Lake City. The Kingpin - a black guy dressed up as a punk rocker of sorts - addresses the crowd and Ashley's accomplices, Daredevil and Punisher, who are chained in the middle of the stadium. Kingpin reminds everyone who "the top dog is" and the fact that he got to be there after offing Magneto. Shortly, he unleashes a couple of raptors which tore them to pieces. Nearby, Logan scopes out the building -- a customized Walmart -- where Ashley is held. Hawkeye then tells Logan of his "genius plan" -- Logan drives Spiderbuggy on the side of the nearby building, build up speed, and crash into the Walmart. Plan worked. Hawkeye then kills off everyone that stood on his path until he reaches Ashley's cell. After freeing her, the Kingpin arrives. 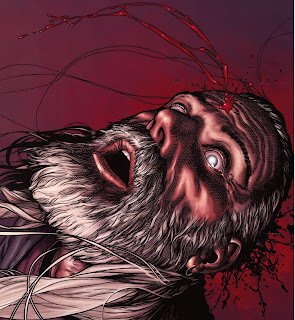 Ashley quickly grabs a shotgun and swings it soooooo hard, that she beheads the Kingpin. She then hits her father. Only then that she revealed her true intentions -- to take over the Kingpin's operations, not to free everybody from the his rule. As she is about to take out his own father, Logan is on the wheel and curses "damn you to hell for making me do this, Hawkeye". 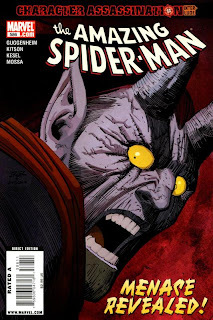 This picks up where Harry Osborn accidentally learns the true identity of Menace -- Lily Hollister. 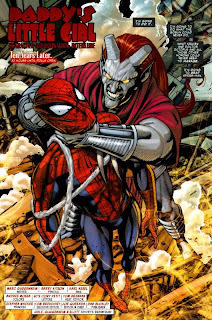 Menace is giving Spider-Man the hell of a beating, knocking him unconscious. Although she could easily have at that point, she needed him alive, to be "paraded around like a trophy" and making his father, Bill Hollister the mayor of New York. She dumps Spider-Man aside to be picked up by the police and flies straight back to the Hollister's Campaign HQ. There, Harry Osborn sees Lily in Menace's costume. Harry takes a momemnt to process everything, but Lily tries to say what she thinks is in Harry's mind: that she dated him only because he was the Green Goblin, and that he's afraid that she doesn't love him. Harry couldn't take it and slaps across the face; Lily strikes back with backhand of her own. She reveals that she knows about the family secret and explains how she learned the truth: months ago, worried about his late nights, she thought that he was relapsing to his drug addiction. Lily searched his room for any clues. In his closet she finds his diary which basically revealed everything. She learns that by moving the book "The Rise of the Norman Empire" on the shelf, the entrance to the secret room will open. 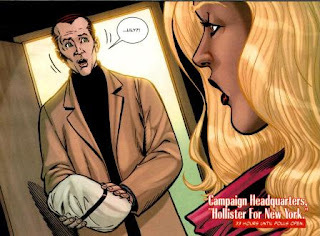 She enters the room and finds the mother-lode of all motherlodes -- there's enough evidence in that room to place Harry's dad, Norman Osborn, in jail for the rest of his life. While looking around, she knocks over what turns out to be a new goblin formula that made her stronger and can transform herself to her 'Menace" form at will. On a sidenote, she also reveals that she kissed Peter Parker who nearly discovers that secret room -- back in ASM #573. Harry insists that she's crazy because as Menace, she keeps attacking her own father. Lily rationalizes the method to her madness: sympathy is a valuable political tool; polls for his father jumped everytime she attacked him. 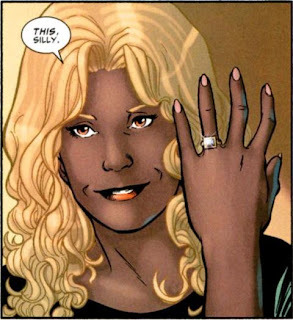 She then shows that she's wearing the engagement ring: yep, she says yes to becoming Mrs. Harry Osborn. She then leaves as she doesn't want to miss Spider-Man's arrest. In closing, on election day, Harry goes to the secret room, takes a vial and a gun, dons a pair of gloves and is about to ride the glider.